The sun is out (albeit intermittently), Canada day has been and gone and our New Year’s resolutions wistfully tossed aside, so you know that we’re now halfway through the year. The past month has been particularly busy at Skunkworks HQ. Firstly, let’s say a warm welcome to your new account manager, copywriter and hot chocolate drinker extraordinaire, me. I am a New Zealander who is fond of puns and doughnuts, not necessarily in that order. This monthly news recap comes to you with notable events some of our clients have been involved in for the month of June. Trial Lawyers Jarvis McGee Rice LLP won a North Vancouver case in which offshore rental property owners were found liable for an infant’s electrical burns sustained by a live extension cord. JMR Lawyers John Rice and Michael Elliott acted for the family in the case, featured in the Vancouver Sun, and The Province. For more on this case click here. Our client Sound idEARS, a hearing and speech clinic, recently launched their new website, which integrates information with clean design and easy navigation. Having just launched sister site Capdots, an online therapy system for those dealing with central auditory processing disorders, Sound idEARS also wanted streamlined usability for their own site. Visitors to the site also have access to the clinic’s services in Mandarin, offering Chinese clients with a transcript of hearing or speech pathology issues. Carol Lau, the resident Audiologist and Speech Language Pathologist can be found at the Sound idEARS office in the Oakridge Centre, South Tower. Surrey-based Disability Insurance lawyers Wirsig Matheos recently added a Punjabi page on their website. The addition of Punjabi extends their reach providing access to the Lower Mainland’s large Punjabi population. The needs of the firm’s Punjabi-speaking clients are handled by Neeta Khatkar Gill, Wirsig Matheos’ fluent Punjabi-speaking lawyer. 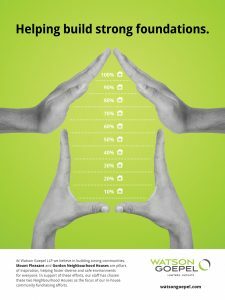 Watson Goepel LLP has been busy in helping build strong foundations for communities in Mount Pleasant and the West End. Mount Pleasant and Gordon Neighbourhood Houses help foster a diverse inspirational setting for anyone who steps through their doors. In support of their work, Watson Goepel LLP staff has chosen these Neighbourhood Houses as a main focus of their in-house community fundraising efforts. Our team worked with Watson Goepel LLP to develop an interactive poster to reach our fundraising goals. Like I said, June was a busy month for our clients and with the arrival of summer, things are just beginning to heat up. See what I did there? I’ll be back with more client news next month.